Day 4: Greatest Accomplishment "Proud of a boss kill? Excited about taming that rare? Over the moon about getting a title? Show us your greatest in game accomplishment!" So we come to day four of Saz's "Fifteen Days-Through Your Interface" screen shot challenge. I spent a bit of time going through my slightly un-organized library of screen shots looking for something suitable. Sad to say, but I came up with zip. Nada. Empty handed. It became time for a plan B. If I could think of one. Perhaps a little bit of Sol's history will serve as a plan B, hopefully. 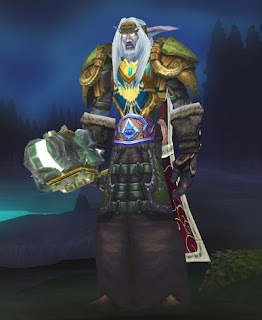 For new-comers to the blog, Sol is a level capped NightElf Balance Druid. I've been playing this game of WoW for close to five years. Sol reached level cap in a rather reclusive, solitary play style through questing, exploration, profession leveling ... I'm sure you get the picture here. In a rather late-to-the-party manner, Sol stumbled through a few 5-man norm Wrath dungeons. Nothing overly spectacular, and he never made of himself 'raid-viable'. Consequently, that adds up to zero boss kills worthy of mention. Cataclysm wasn't much kinder for Sol, although he did become a member of a really great guild...after solo questing to 85. He faultered through a couple of 5-man norms with the aid of friendly and tolerant guild mates, which led him to become supportive in more of a background way by his own choice. Obviously not a hunter, Sol never tamed any rares. He did for a time though, make a mission out of world bouncing to solo kill as many rare elites as he could for a time. Each one proved to be something more in the way of personal accomplishment, rather than game accomplishment. So these are things he simply holds within his own memories. Titles: lol. Sol does hold a good sized hand-ful of titles to display, when he so chooses. Nothing earth or game shattering though, just many of the usual ones. These are along the lines of various alliance faction rep standings through the argent tourney, archaeology and so forth. His very first title was Explorer, well before the Shattering, and later with Cata, The Explorer. When Sol does display a title, this is the one of choice. It is short, and to the point in so far as being descriptive of his nature. The memories of all the foot races and later ground mount runs to explore each zone are alive and well within. Even the too-many-to-count corpse runs while trying to add various Horde cities and camps needed for the zone achievements. Even though this title is rather common now for most players, Sol still holds it dear to heart. Although for Sol, there is no real "greatest in game accomplishment", there is the much more personal accomplishment for me to play this game, and get a character to level cap. Up until most recently, Sol stood alone as the only level capped character. For everything he is, and is not, I'm very proud of him. Not all accomplishments must be grand, so long as they are important to you! Looking forward to more TYI posts Sol :) I like your prose with your pics. Hi Sparrowgal, and welcome to MJ!